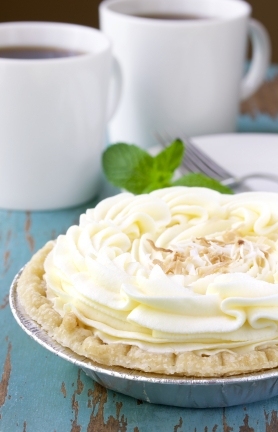 This easy coconut cream pie recipe from scratch produces a pie that is delightful and sinfully delicious. A slice of chilled pie with a great cup of coffee is a wonderful get-away if even for a moment. This is one of Dorie Greenspan's recipes from her cookbook "Baking, From My Home to Yours." Another thing to consider is the crust. I love this pie with a homemade graham cracker crust. It's up to you and your tastes. Enjoy. This recipe makes two pies. Mix the pie crust ingredients together, adding just enough water so that the dough isn't hard. Rather than roll the dough out, just cut it in half and push it into two pie tins. Bake the pie crusts in the oven for 11 minutes and let them cool. Reduce the oven temperature to 350 degree. Next, here comes the magic with this coconut recipe. Stir all the filling ingredients together except for the vanilla. Time and stirring is essential...stir, stir, stir. After you're nearly done stirring, about 10 minutes into it, add the vanilla. Pour filling into the pie crusts. Whip up the meringue ingredients and spread the meringue on top of the filling. Once the oven has cooled to 350 degrees, bake the pies for about 15 minutes.